Jill Gooder is between a rock and a hard place. A close ally needs her help, but to come to her assistance may have grave consequences for Jill. 5.0 out of 5 starsSomething appears to be fishy. Once again several stories come together with great results. Jill is still as funny as ever and poor long suffering Jack garners no sympathy whatsoever. The twins fail to out do each other again, but they were a great set up for what is happening in the creche. I absolutely LOVE this series! 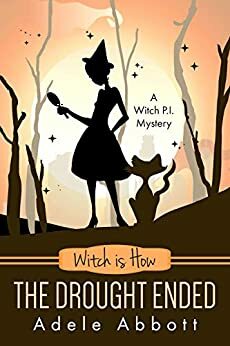 For a guy that really didn't like anything "witchy", I've become hopelessly enamored of Jill, Grandma, Aunt Lucy, Mrs V, Winky and the entire cast of characters imagined and wonderfully contrived by author Adele Abbott! I enjoy the multiple plots, the snarky humor and the wild ride of character interaction! A MUST read!!! I like how Jill solves lots of mysteries but rarely ever gets paid for it. She's clever and I enjoy how her mysteries usually involve both the human and sup worlds. This book is no different including a flower theft and mischief caused by a ghost. Theres enough humor and I like when Jill breaks the fourth wall. 5.0 out of 5 starsIt's an intriguingly continuous mystery and humor. I'm impressed with how soon Adele's books become available and not have to wait for years like some of the other authors. When I read her books, it makes me feel as if I'm a part of the story line and right there in the moment. Love it! Keep em coming Adele. 5.0 out of 5 starsAdele is awesome! I absolutely love this series, and always pre-order the next in the series. Jill is who I want to be when I grow up.